Tuesday, September 22, 2015 4:00 PM Edsel Ford High School AWAY 17 Garden City High School HOME 44 Meet Recap EF Starts off the WWAC Cross Country season with a17-40 win over Garden City. EF is 2-0 on the season. 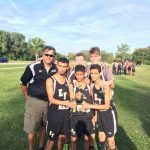 Tuesday, September 22, 2015 4:00 PM Edsel Ford High School AWAY 26 Crestwood High School HOME 30 Meet Recap EF Starts off the WWAC Cross Country season with a 26-30 win over Crestwood. EF is 1-0 on the season.